T-series has finally overtaken PewDiePie Youtube channel and becomes the biggest YouTube channel in the world. Let’s discuss T-series and Pewdiepie before we will write more about how t-series Overtakes Pewdiepie to become the number one youtube channel. T-series is a record label and film production company in India. The company is founded by Gulshan Kumar in 1983. T-series company is primarily known for Bollywood music soundtracks and Indi-pop music. In 2014, T-Series is India’s largest music record label that has up to a 35% share of the Indian music market. It is followed by Sony Music India and Zee Music. T-series is Indian film production house and music label. It has a multi-channel network on Youtube, it has 29 channels which has more than 140 million subscribers as of January 2019. T-series channel Primarily shows music videos and also film trailers on Youtube. 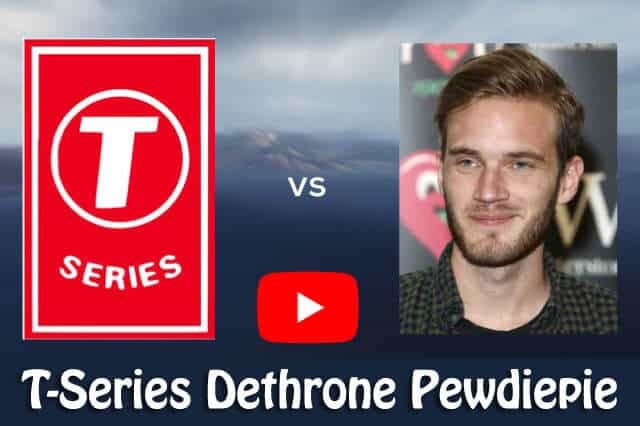 In January, T-series became the Most-viewed Youtube Channel with more than 62.8 billion views as of February 2019. The T-Series channel Features content in the Hindi language, Urdu and Punjabi language content. Pewdiepie is a Swedish YouTube channel and formerly the biggest YouTube channel in the world before T-series overthrone the Youtube channel. Pewdiepie Youtube channel mainly consists of Let’s Play commentaries, Vlogs, and comedic formatted shows. The owner of the channel is Felix Arvid Ulf Kjellberg and he is popularly known as Pewdiepie online due to his Youtube Channel. Pewdie is the biggest Youtube channel since 2013 but presently, the channel has been decrowned by Indian film production house and music label, T-series. 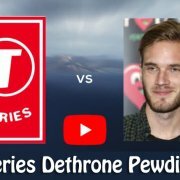 T-Series has finally decrowned Swedish YouTuber channel Pewdiepie. Indian film production house and music label, T-series is presently the biggest YouTube channel in the whole world. Currently, Pewdiepie has 90.47 million subscribers while T-series has over 90.49 million subscribers. The two channels have been contesting for who will be the most subscribed youtube channel. Finally, T-series had emerged has the number 1 youtube channel in the world.